Apple’s Monday keynote at its Worldwide Developers Conference was jam-packed with information about the company’s new operating systems and development tools. As such, it’s no surprise that a slide entitled “iOS 8 features we didn’t have time to talk about” made only a lightning-brief appearance. But we picked through that slide to find some of the intriguing new features you may not have realized were coming to iOS 8 this fall. Panorama photos in iPad: We’ve been able to take panorama photos on our iPhone since iOS 6, but the iPad has been left out of that fun. Fortunately, it looks like iOS 8 will bring the wide-format pictures to Apple’s tablet as well—though you might get some looks as you pan across a vista with your 9.7-inch tablet in hand. In addition to panoramas and videos, iOS 8 adds a new time-lapse option to the camera. Time-lapse video mode: iOS 7’s Camera app introduced the modal carousel, which offered users different options for shooting video, photos, slow-motion video, square images, and panoramas. 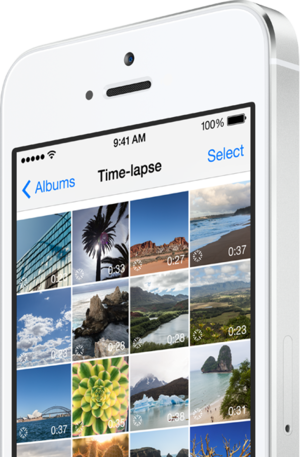 iOS 8 looks to introduce a new mode: Time-lapse video. Just point your device and press record, and the app will snap photos at dynamic intervals to create a timelapse video—no manual speed modulation or editing required. Add a camera timer: Though front-facing selfies are all the rage, sometimes you want a bit more quality and control to your images. With iOS 8, it looks as though selfie-takers will get that extra edge with a camera timer. If it’s anything like the similar feature found in third-party apps, it will likely have several options for a delayed shutter, probably up to 10 to 15 seconds. Separate focus and exposure controls: Not only will developers have access to manual camera settings such as focus and exposure points for their third-party apps and extensions, but you’ll also soon be able to independently control the focus and exposure of a scene in iOS 8. There are several ways the Camera app could implement this, including tap-to-focus with an exposure slider or two separate tap-to-focus reticles. Since its introduction, the iBooks app has been the red-headed step-child of the iOS app suite—to access iBooks, you first had to download it from the App Store. If Apple’s iOS 8 slide preview is any indication, it looks as though new devices will get to skip this step come the fall and have iBooks pre-installed, just like any other system application. It appears that any books you’ve purchased from a single series (say, Game of Thrones) will appear grouped together on your bookshelf, rather than as individual titles. 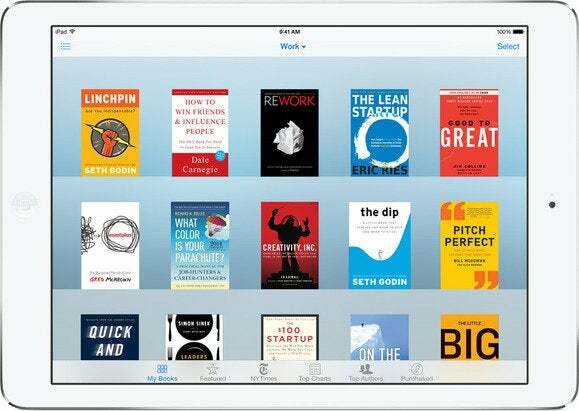 iBooks is now built-in when you install iOS, rather than requiring a separate download. And it gets a few new features. Auto night mode: iBooks in iOS 7 offers a night mode with gray-on-black text that’s easier to read in dim-lighting. iOS 8 takes that up a notch with an auto-night mode that can presumably flip over to that night setting when it recognizes that you need it—though whether it does so simply by time of day or by looking at the ambient light around you, we don't yet know. In addition, Siri will soon be able to recognize what song is playing on the radio thanks to integration with Shazam, even letting you purchase the song on the iTunes Store if you don’t already own it. And, taking a nod from OS X’s Enhanced Dictation, Siri will recognize and transcribe words as you speak, rather than waiting for you to complete your command. Private browsing per tab: In OS X Yosemite, Safari now offers the option to create a new private browser window. Obviously, iOS doesn’t have windows, so it offers the next best thing: private browsing on a tab-by-tab basis. That way you don’t need to switch your entire browser over to private mode when you need to view a sensitive website, such as your bank’s. Instead, you can just devote a single tab to it and be confident that, when that window’s closed, your privacy will be maintained. 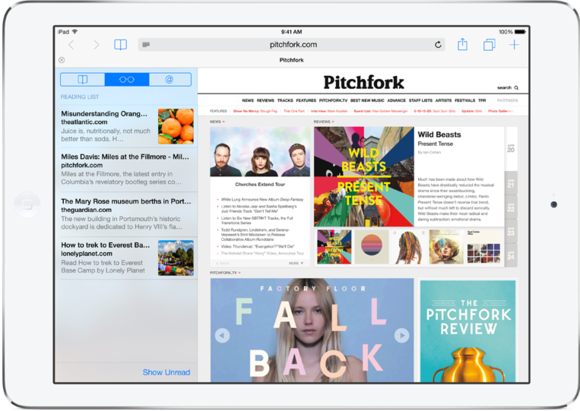 Besides a new design, Safari now lets you incorporate RSS feeds into its Shared Links section, as well as offering private tabs and more. RSS feeds in Shared Links: As with OS X Yosemite, Apple is once again bringing back support for the RSS syndication service—this time building it into Safari’s Shared Links section. When you come across a link to an RSS feed on a website, you’ll be able to tap on it and add it to Shared Links, where it will be commingled with any links from social networks that you’ve set up there. DuckDuckGo support: Apple’s once again expanded its search engine offerings in Safari, adding this simple, streamlined site—particularly well known for its emphasis on privacy—to the likes of Google, Yahoo, and Bing. We presume you’ll be able to choose it as a default in the Settings section of Safari. Battery usage by app: Want to know which of your many apps are really chewing through your battery life? Just as iOS 7 brought us a breakdown of cellular data usage on an app-by-app basis, iOS 8 is doing the same, but for battery life. Hopefully this will make it easy to avoid vampire apps and keep your battery running longer. The Health app offers an emergency card that summarizes important details including conditions and emergency contacts. 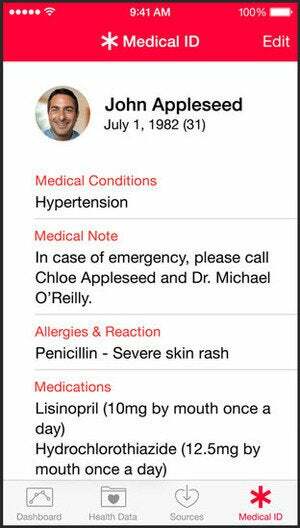 In case of emergency card: Included in iOS 8’s new Health app is a card containing important personal medical details, such as existing conditions, allergies, and emergency contacts. It’s one of those features that you hope you never really need, but would be plenty glad it’s there if you do. FaceTime call-waiting: If you’re a popular FaceTime conversationalist, you may find yourself receiving an invitation to talk while you’re already on a call. iOS 8 will offer call-waiting for those video (or audio) chats, meaning you could put your current conversation on hold while you field a new one. Wi-Fi calling: We’ve all been there: You need to make a phone call, but your cellular-network signal is pretty weak. With iOS 8, if you have a strong Wi-Fi connection—and your carrier supports it—you can make calls and send text messages over the Internet. T-Mobile has already said that it will be onboard when iOS 8 launches this fall; we expect we’ll hear more from the other carriers in the not-too-distant future. Rich-text editing in Notes: The built-in Notes app in iOS has never been particularly complicated, but in iOS 8 it finally gets support for rich text. So if you’ve been dying to bold, italicize, or underline your important personal jottings, iOS 8 is the update for you. Travel-time notifications: In OS X Mavericks, Calendar let users specify how much time it would take for them to get to an appointment, so that the app could properly notify you when it was time to leave. (In some cases, Calendar could even do that automatically, if it knew where you were and where you had to go.) It looks like that same functionality has come to Calendar in iOS 8—no surprise, given that the Today view in Notification Center could already often provide that information. 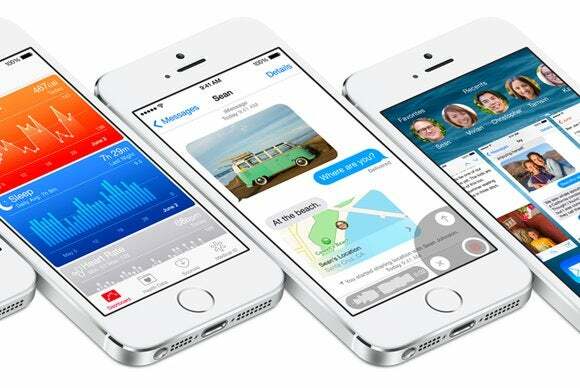 There are a host of new accessibility features in iOS 8. VoiceOver can now use the much more natural Alex voice that OS X has long sported; there’s multi-device support for Made for iPhone hearing aids; improved zoom; a “speak screen” action; and support for a Braille keyboard with direct 6-dot Braille input. The Guided Access feature introduced in iOS 6 gets a few new additions as well. For example, you can now authenticate via Touch ID to exit the Guided Access mode, as well as impose time limits and a countdown timer. As always, there are a handful of things on the slide that weren’t self-explanatory. For example, there was a reference to a Tips app (which we assume involves tips for using your device, and not simply calculating your gratuity at a restaurant), the promise of flyover city tours (see Paris without ever leaving the comfort of your home? ), and place cards in other apps (presumably so you know where to sit the next time you visit Downton Abbey). For these, we may have to wait until iOS 8 debuts to get the full details.